Bed And Breakfast1291 sq. 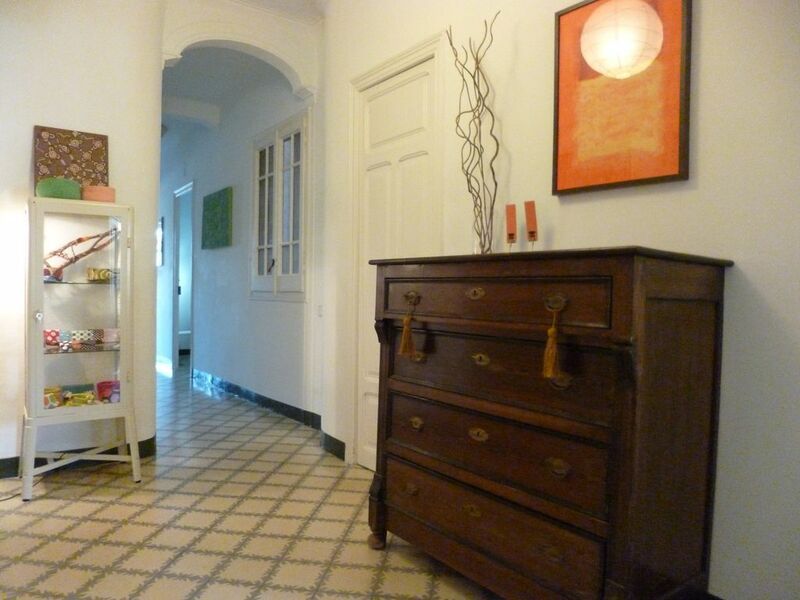 ft.
Poblenou Beach is a bed and breakfast located in a building which dates back to 1895 and is located in Poblenou, the former textile area of Barcelona which has, in recent years, become a trendy and bohemian area of the city. Walking through this post-industrial area for a few minutes, you can easily reach the city’s beaches. And if you fancy exploring further back into the city’s past, the Gothic neighbourhood is just a 10 minute metro ride away, home to the Cathedral, the Picasso Museum and much, much more. There is a metro station located just 100 metres from the B&B. The Poblenou Guest House Beach offers a total of seven twin rooms with access to a 3 shared bathrooms. Breakfast is served each morning in the dining room, although if you prefer you can make it yourself whenever you like. The B&B will provide you with all kinds of tourist information so that you can make the most of your stay in Barcelona. Wi-Fi access is also at your disposal throughout the property. The ideal place to enjoy Barcelona and its beaches! Very nice place, Mercedes is wonderful. I would go back again anytime. Super friendly host, great B&B in fantastic location. Fantastic B&B in a great location. Mercedes was super friendly and very kind hearted. Best hospitality we had during our Europe trip! As soon as we arrived, Mercedes greeted us with a huge, warm welcome. She provided breakfast every day, tips on navigating the city and what we should see, etc., not to mention great conversation! It was as if we had known her for a long time. The apartment itself is very clean and tidy. The bathroom is shared between all the guests but we did not have any issues with that! (Like I said, Mercedes did an awesome job keeping up with cleanliness). It is very quiet at night which helps when you come back from a long day and all you want to do is relax and rest. The location is GREAT!! 10 min walk from the beautiful beach and a 5 min walk to the metro. Many great restaurants on the main road (“El 58” for tapas is a MUST!!) If you have access to Google maps it is very easy to also take the bus from place to place with a metro/bus pass. Overall we felt very much at home here and would definitely stay again if we ever venture back to Barcelona! My wife and I stayed in this flat in May 2017. Mercedes, the owner, is a very nice, helpful, and informative person who you come to like right away. The location of the flat is about a 7 minute walk to the beach and a four minute walk to the train station, where you take the train to travel to tourist destinations. I suggest you down load the train app, before you arrive, to get from point A to B a lot easier. I was a bit disappointed with the rental because you actually rent a room in Mercedes apartment. You share the same restroom with other people who rent the other rooms. The bedroom we got had a small window that faced the inner part of the building, so we got no sunlight. All the rooms have two single beds in them, and that surprised me, a lot. I'm vacationing with my wife and we had to sleep in separate beds. That was not cool. In one of the rooms, the two beds were placed side to side, to make it one bed, but that looks uncomfortable. With the bad aside, the location of the flat is prime because you have everything you need within walking distance. Shops, restaurants, bakeries, stores, Cafe's, and the beach. The owner (Mercedes) is a great person who will guide you information about Barcelona. Wonderful host and excellent location! The host Mercedes was very helpful and provided us with many tips how to enjoy our stay in Barcelona. The location was just terrific - a minute away from the metro station and just a short walk to the beach. We had a room with balcony and it can be a bit noisy but we loved it. Having a coffee on the balcony in the morning and watching the lively street (only pedestrians - no cars) at night gave us the real Barcelona feeling. Room was big and comfortable and the bathrooms were spotless!